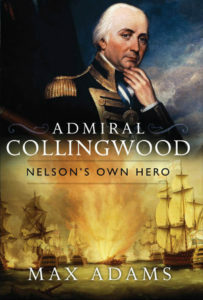 Admiral Lord Collingwood is the subject of Max Adam’s first historical biography, published by Weidenfeld and Nicholson (and now reprinted by Head of Zeus). The genesis of the book was a short series of films for Tyne-Tees Television about North-East heroes. Collingwood, whose statue stands looking out to sea at Tynemouth, was an obvious candidate; but Max couldn’t find a book about Nelson’s second-in-command at Trafalgar. A Winston Churchill Fellowship allowed him to travel the world in Collingwood’s wake and correct the injustice done by history to one of England’s finest men. Admiral Lord Collingwood, the eldest son of a Newcastle merchant, went to sea in 1761 at the age of thirteen. In his nearly fifty years in the Navy he rose to become a fine seaman, a master of gunnery and a battle commander the equal of his friend – and rival in love – Nelson. He was also an accomplished writer and wit, an environmentalist, a doting father, inveterate gossip and consummate diplomat and strategist. Collingwood’s service took him to Boston, where he lived and fought during the American War of Independence; to Antigua, where he and Nelson both fell in love with Mary Moutray; to Corsica; Sicily; and Menorca, where he began as a young midshipman and ended his career as the effective viceroy of the Mediterranean. Max’s biography follows in his wake, using many of Collingwood’s own marvellous words to bring the great man to life. Admiral Collingwood: Nelson’s own hero is an intimate portrait of a forgotten British naval hero and a thrilling portrait of the glory years of the age of sail.